Revealing mistake: In at least one scene, you can see the ruts that the filmmakers made in the greens to make Happy's putts go where they wanted them to. Revealing mistake: In the scene where the Volkswagen is driving on the golf course to run over Happy, you can see tracks in the ground where the car had already been. Continuity mistake: The exact same shots of the golf ball sailing through the air are used two or three times, especially during the last golf tournament. Continuity mistake: After Happy gets hit by the car he's lying on the ground and you can see he's only wearing the Subway shirt. But when he tees off near the end he's wearing a shirt over the subway one. Continuity mistake: At the final golf tournament, Happy's grandmother tells him she just wants him to be happy. In one shot, both her hands are up towards Happy, in the next shot only her left arm is up, and in the next shot both hands are up again. Continuity mistake: When Happy is about to putt and the tower starts to fall, his caddy is behind him. In the next wide-angle shot, his caddy is in front of him, or at least between Happy and the hole, where before Happy was between him and the hole. A couple of shots later, when Virginia runs up to Happy, the caddy is back to his old position again. 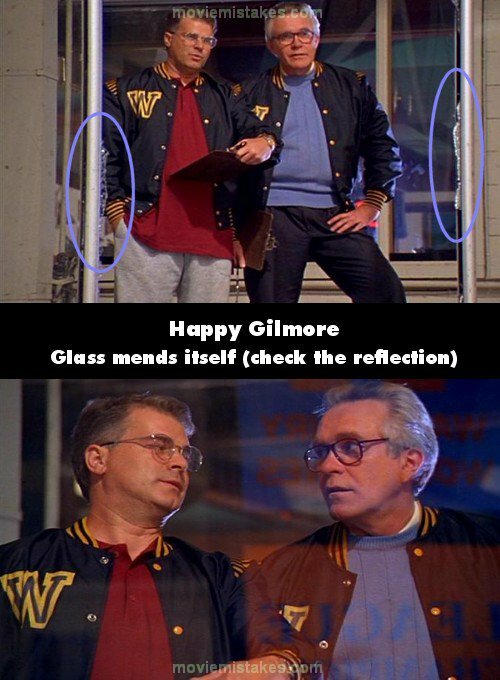 Continuity mistake: Happy and his new caddy are discussing the shape of the green and the caddy says the green is slanted to the left. When Happy tells him it only seems that way because he's missing a shoe, the caddy is standing with his feet shoulder-width apart. When the camera cuts to the close-up of his feet, they're together, yet the caddy didn't move. Continuity mistake: When the alligator takes off with Happy's golf ball in his mouth, he takes off and slides down into the pond where he goes through a patch of water-lilies. When Happy dives in the water after the alligator there are no water-lilies. 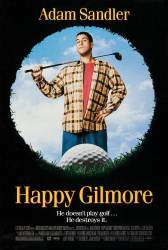 Happy Gilmore: I'm stupid. You're smart. I was wrong. You were right. You're the best. I'm the worst. You're very good-looking. I'm not attractive. The evil man at the nursing home is played by Ben Stiller, then a rising star, in an uncredited role.